I’ll give you a hint: There’s lots of AI in it. Siri, what's the weather today? Alexa, is it cold outside? OK Google, do I need a jacket this morning? Weather status is the most common voice inquiry asked of consumer-oriented virtual assistants, as Cisco Collaboration chief Jonathan Rosenberg remarked to press and analysts gathered at Cisco's San Francisco Innovation Center this week. But when it comes to virtual assistants in the office environment, things aren't quite as simple. 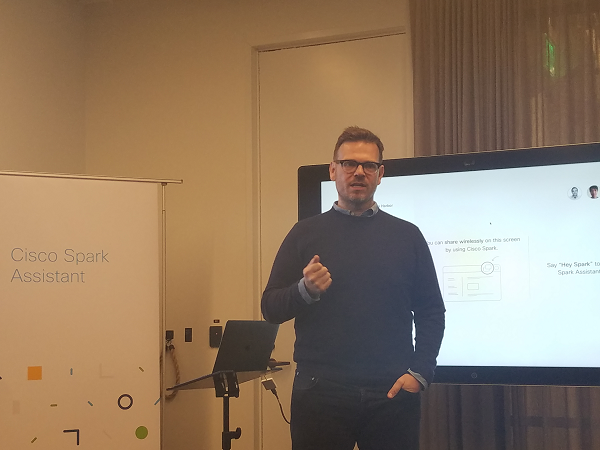 In fact, designing AI systems for enterprise and business user requirements is quite complex, as I learned at the half-day event showcasing how Cisco is bringing artificial intelligence (AI) into its collaboration portfolio and beyond. As such, Cisco intends to be "pioneering [in] this field for many years to come," Rosenberg said. To help guide its AI efforts, Cisco surveyed more than 2,000 workers on attitudes toward AI (see "Meetings, Meet AI"). "We wondered, if we build it, will they come? And thankfully, the answer is yes," he added, noting that 95% of respondents indicated they would use AI for work tasks. Computing is becoming ambient, "embedded into everything around us" and opened for access in shard spaces like our living rooms at home and conference rooms in the office, Rowan Trollope, SVP and GM of IoT and Applications at Cisco, remarked in opening the event. But four key drivers make ambient, shared computing in business dramatically different than what's at home. These are identity, context, environment, and security, Trollope said. Take identity as an example; a virtual assistant in your living room only has to worry about identifying people who live in the house, but a virtual assistant for your office has to deal with identifying hundreds of employees that share workspaces. To solve the identity problem, Cisco invented an ultra-high frequency pairing and identity technology for the virtual Spark Assistant it introduced last week. The technology incorporates mobile devices, facial recognition done through vector analysis, and speaker tracking performed through its video and audio equipment. Once Spark Assistant has confirmed a user's identity, it will be able to provide meeting details and other contextual information as appropriate. Needing to be able to deal with the context of teams is one of the reasons Cisco acquired AI platform provider MindMeld earlier this year, Trollope noted. In a modern meeting space, what's on an individual's smartphone "moves from the hand to the wall," requiring security and environmental considerations that don't come into play for home-use virtual assistants, Trollope added. For example, you wouldn't want the Spark Assistant to expose your personal or confidential information to all meeting participants. But if you're alone in a conference room with a Cisco room system, Spark Assistant will recognize that and display content that's appropriate for your eyes only. But when it comes down to it, Cisco's efforts are "all about how we help teams get work done together," Trollope said. Click to page 2 for more on what Cisco is doing with AI today and in the future.